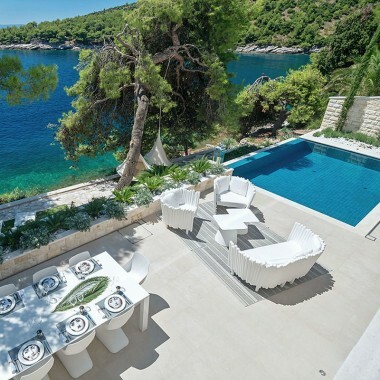 This stunning seaside holiday villa to rent is superbly located in the middle of the perfect Duboka Bay in Croatia, magically concealed from the outside world. It is set amongst pine trees, olive groves, and gardens which cascade down to the stunning beach. The nearest village is Milna, which is approximately 2km away. Here guests can find supermarkets, butchers, fruit and vegetable market, restaurants and cafes. There is also an ACY Marina and a petrol station so everything needed is in very close proximity. 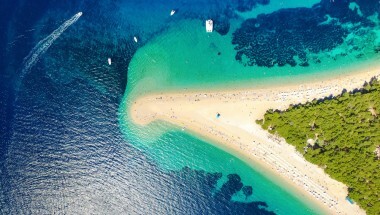 You can anchor a motor or sailing yacht outside the villa if you want to explore nearby islands: Hvar, Viec and Sholta. 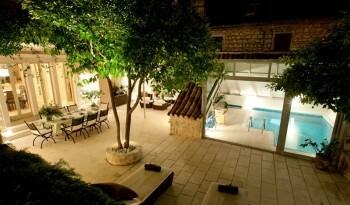 Hvar Island with its lovely old town is just 25 minutes away from the villa's sea steps. The nearest ferry port is Supetar (about 20kms from the villa) and from here there is a direct ferry to Split. The villa has private parking for three cars. The solar heated swimming pool, which fills with fresh seawater, is set spectacularly into the natural rock overlooking the sea and all sides of the bay. There are direct steps down to the sea directly from the garden and pool. There is superb swimming and scuba diving along the adjoining coast. The elegantly rustic holiday villa features local Croatian stone, beam ceilings, archways, and French windows which open to covered shady verandas. The main villa is on one level with three bedrooms. All living areas and bedrooms open onto verandas and terraces with sea views. The kitchen is fully equipped for gourmet cooking with a separate dining area and living room that opens out onto a lovely outdoor covered dining terrace. The kitchen has a large stone barbeque oven and a separate utility room with washing machine and extra kitchen appliances. The large inviting master suite has beautiful oak wood flooring and sitting area. It has a king size bed and ensuite shower room. Double French windows open onto a large covered veranda (with double lounging bed) and a 360-degree round stone terrace, surrounded by sea views. This bedroom has air conditioning. There are two additional bedrooms in the main villa, one with a queen size bed and the other with a large single bed. Both rooms have elegant furniture and oak wood flooring. They share a private East facing covered veranda that catches the morning sun and afternoon shade. The shared shower room is large, with a separate toilet for added privacy. The charming guest house has original architectural features such as a stunning vaulted wooden beamed ceiling. It consists of an open plan lounge with sofa bed, bathroom and a galleried sleeping area (for two), offering sea views. This stunning little house opens up onto its south facing veranda, with views over the gardens, pool and the sea beyond. The guesthouse is equipped with air conditioning. There is also a recently renovated 2-bedroom apartment which can be rented for large groups at an extra cost. Living room. Dining room. Fully equipped kitchen. Master bedroom with en-suite shower room (additional bed can be added on request). Double bedroom. Single bedroom. Separate bathroom. Living room with single bed. Dining area. Double bedroom gallery. Full bathroom. One double bedroom and one single bedroom with shared bathroom. Weekly maid service (additional service provided on request). House manager on-site in separate living area to supervise personal touch service for the guests and to ensure their comfort and privacy. Upon request, the house manager can be relocated for complete privacy. Other bespoke services and activities can be arranged on request – such as chef services, yacht chartering, diving, sailing, cultural tours of nearby galleries and more. A stunning seaside holiday villa located in Duboka Bay, near the village of Milna, with food shops, cafes and restaurants. Steps lead directly down to the sea below from the villa's garden and beautiful swimming pool. The nearest ferry port is Supetar with direct ferry to Split. Separate 2 bedroom apartment prices also available on request. 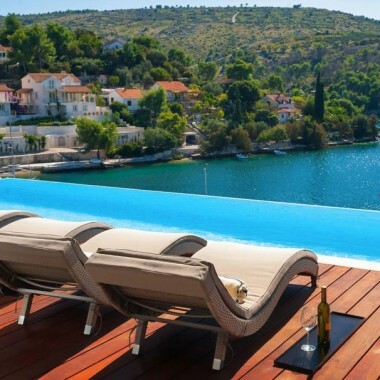 Special Rates at this fabulous Hvar Villa!